Meet Bruno, #TeamEliteCork’s newest member. Bruno has come to us all the way from Brazil and we are so delighted to welcome him to the team! 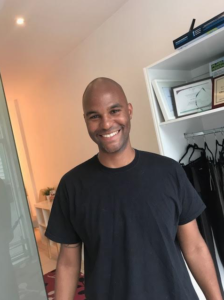 Bruno is a qualified physiotherapist and you can find him in our Donnybrook studio teaching Mat (and soon reformer!). Here’s the story of Bruno’s pilates journey. I’m Bruno, I am 26 years old. I got my physiotherapy degree when I was 21. I am communicative. I like learning about people. I’ve been teaching pilates since 2014 and where I worked I could fill my class up with clients so much so that the owner had to enlarge the timetable. I like new challenges, finding new solutions for clients and always motivating my clients. I like to explain what’s going on in their body during pilates class because the physiology is fascinating. I’ve been working with Elite for about 1 month. I got my university degree in December 2013 and I started my Pilates course in January 2014. (I was a little excited, I could wait to study pilates!). During the last week of my course, a friend of mine from university invited me to work in the same company where she was teaching Pilates. I didn’t think twice in accepting that! The good mood. I feel comfortable at the studio working. The energy is great. At that time in my university, my teachers were always asking how we could serve our clients before they get injured or create any prevention program of exercise. At the same time they were talking about pilates or functional training. I decided to follow Pilates because it was growing and growing. And the idea about prevention would be beneficial, because only a few people were teaching it that at that time. What 3 words would you use to describe Elite Pilates? What are your top 3 passions and why? How do you spend your time when you arn’t teaching pilates? Reading books, going to the cinema and playing soccer or basketball. What advice would you give to anyone wanting to give pilates a go? Don’t compare yourself with others, you are unique. You body is your temple. Take care of your temple. Listen to your instructor.